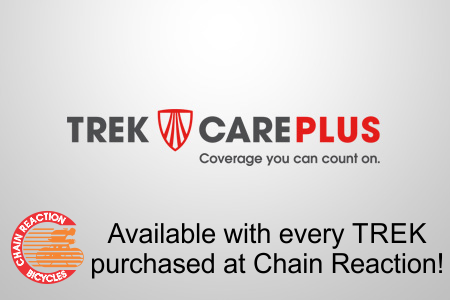 Protect your new Trek bike from accidental damage while riding, and get free replacement of many common wear & tear items! If you ride a lot, you could save hundreds, even $1000+ on cassettes, chains, wheels & more. Just $49 - $499! What's covered under Wear & Tear? What if my bike is on my roof rack and I run it into the garage? Sorry, you're not covered. You must be riding your bike when the damage occurs to be covered. What if I'm cruising the local single track on my Madone and I taco my rim? Is that covered? This program is a no-brainer for people who ride a lot! The big savings will be in chain, cassette & chainring replacement, with the added benefit of accident damage thrown in for good measure. If you're wondering why the pricing ramps up rapidly for the more-expensive bikes, it's likely due to the expense of replacing high-end carbon road frames. But again, keep in mind this does not cover bike-car damage, ever. If you're going down, aim for something other than the car. Better yet, don't crash in the first place. 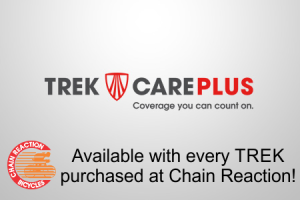 Remember, this covers only Trek bicycles, nothing else, and only Trek bicycles you've purchased new from us within the past 60 days.